Please sign our guestbook at the bottom of this page. While God's miracles need no assistance from us, the miracle we NEED is assistance from you with donations of time and financial resources in order to assist these families. Austin's Miracle Fund is a nonprofit 501(c)(3) christian charity corporation founded in November 2000 to assist families of pediatric cancer patients and their families. We filed our Form 1023 application with the IRS to receive our certificate of non-profit status in February 2001. We have updated our information with the IRS effective June 2002. We are members of the Northwest Houston Chamber of Commerce effective May 2002. We have forwarded information to the Better Business Bureau effective June 2002 regarding becoming members of the BBB. Our goal is to be a growing charity organization that works with the community to reach families of pediatric cancer patients. At this time, we are only able to assist families in Houston, Texas and the surrounding areas. Our goals are to grow to include not only the State of Texas but to become a nationwide charity fund. Austin Firth was diagnosed with brain cancer in October 2000 just after his 3rd birthday. Michelle Wyatt, Austin's aunt and president of Austin's Miracle Fund, soon realized the overwhelming needs the family was encountering. In November 2000 she began having fundraisers and assisting with the care of Austin while he was in the hospital. After seeing other families with the same or greater needs she began raising funds to assist families with pediatric cancer patients. Austin's Miracle Fund's mission is to enhance the quality of these families lives by providing financial aide and spiritual ministry. We want to assist families with rent/mortgage, utilities, groceries, clothing, furnishings, automobiles, items they may not be able to afford and free childcare for the children with cancer. AMF has volunteers that have assisted with cooking meals, housecleaning, yard work and more. Everything we do is to help the lives of these families be a little easier. AMF's mission is to take care of these extra items in order that they may concentrate on obtaining the proper medical treatment for their children. We hope to provide assistance to families with low to moderate incomes and the children must be under 18 years of age. There are so many families that are in need that it is difficult to put a number on the amount of children that will benefit from this program. All families will be required to fill out a Request for Assistance Form and the funds distributed will be based on the needs. The funds will not be paid directly to the families instead AMF will pay the creditor (utility companies, landlords, etc.) directly in order to avoid any misuse of funds donated. We will use grocery gift cards and gasoline gift cards as well. At this time the fund is based on volunteers. Austin's Miracle Fund raises funds from a variety of sources including corporate gifts, individual donations and special events. We have held a rummage sales, dinners and auctions to raise funds. We are currently speaking with Melvin Adams, former Harlem Globetrotter, about setting up a celebrity basketball game. We are also working on benefit concerts and golf tournaments. For more information on pediatric brain tumors please click here. For more information on childhood medulloblastoma please click here. If you would like more information on Texas Children's Hospital and their services click here. 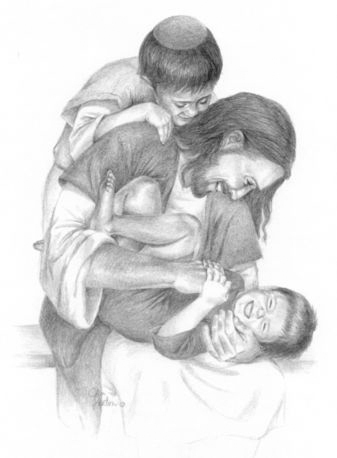 Jesus said, "Allow the little children to come unto me." Please sign our guestbook and let us know what you think of our organization.